Research in our laboratory focuses on the understanding of the molecular mechanisms of toxicity induced by toxic chemicals and natural products. Benzene is an industrial and environmental myelotoxicant and it has been demonstrated to cause hematological disorder including leukemia. Our laboratory investigates the molecular regulators of benzene induced apoptosis and DNA damage. The genes of interest in our laboratory includes Fau and NQO1. Stryryllacytones and stilbenes can be found in several plant species although iin the past few years, there have been initiatives to synthesise various analogs of these chemical. Our laboratory is interested in understanding the molecular mechanisms of apoptosis and chemoprevention induced by these analogs. 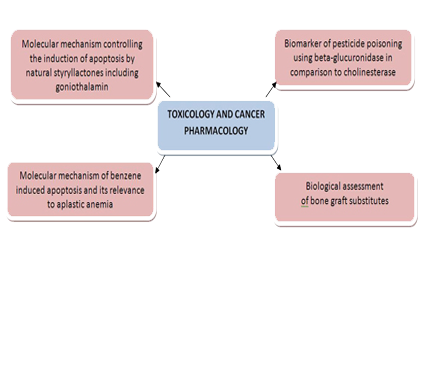 Determination of mutagenic effects of chemicals using the OECD guidelines for mutagenicity. This project is based in Melaka Biotechnology Corporation. Our laboratory is currently being prepared for GLP certification and chemicals including industrial chemicals and also herbal products are being tested using Ames, Micronucleus and HPRT gene mutation tests.